One of the goals of the Shreveport Reconciliation Dinner project is to connect participants with other community members who are working against systemic racism through their community involvement, profession, or creative expression. This space highlights both existing community resources and new initiatives created by participants in the Shreveport Reconciliation Dinner. To suggest additions to this page, please contact Kate Pedrotty at kpedrotty@centenary.edu. Several participants at the 2018 Shreveport Reconciliation Dinner came together after the dinner to create a program to recreate the spirit of the dinner in smaller, more intimate setting: participants’ homes. Read more about Dinner & Dialogue and learn how you can get involved! Dialogue on Race is a six-session series led by trained facilitators that encourages open and honest discussion. Topics discussed include definitions of racism, prejudice, and stereotypes, examples of personal experiences of racism, institutional racism and power, changes that have occurred and those still needed, and action steps for individuals to effect change. For more information, visit ywcanwla.org or contact Rachel Scott at scottrl@bellsouth.net. The YWCA’s Book Club on Race brings together community members who share a love of reading and a desire to participate in productive discussions about race. The club meets on the second Thursday of each month at 5:30 p.m. at the YWCA office (850-B Olive Street in Shreveport). Contact Crystalyn Whitaker at crystalyn.whitaker@gmail.com for more information or to join the email list. Contact Robert Trudeau at 318.272.6045 to schedule. Tours start at 10:00 a.m. in front of Bon Temps Coffee Bar. Tours begin under the Red River Bridge and discuss the indigenous people, slaves, and free people of color while walking up Texas Street, pausing at the statue of Leadbelly to learn about one of the fathers of American Folk Music. The tour continues past the Caddo Courthouse and Confederate memorial until it reaches the head of Texas St at the junction of the First Methodist Church and Sprague St, one of the boundaries of the legal red light district of the 1910s, the St Paul’s Bottoms. 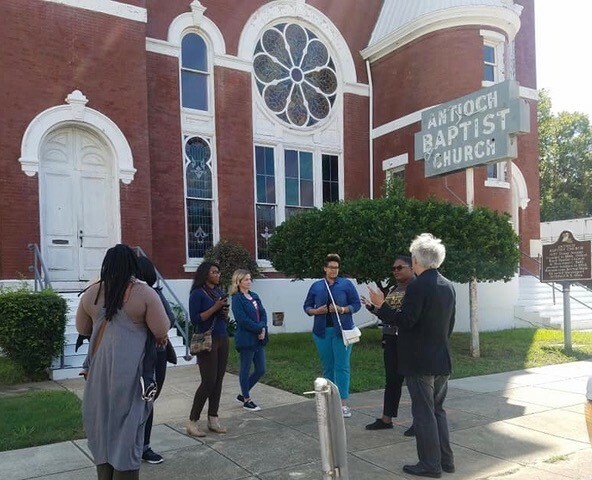 The tour continues on Texas Avenue, once the Texas Trail, and passes the Municipal Auditorium.Stops include the Calanthean Temple, a black business center built in 1923, and Antioch Baptist Church, built in 1903. Participants return to their vehicles by foot or bus pass. The documentary film Beyond Galilee traces the early days of the civil rights movement in Shreveport, using a 1958 speech delivered in Shreveport by Dr. Martin Luther King, Jr. as a backdrop and starting point. The documentary blends interviews with people who led and experienced Shreveport’s struggle for civil rights with newly uncovered 16mm film footage of meetings, marches, and other civil rights events. The documentary was produced in 2012 by Joey Kent and Tim DeWayne and has been screened several times in the Shreveport-Bossier area, often accompanied by a panel discussion with individuals who lived the events depicted in the documentary. The next local showing/discussion of Beyond Galilee will be at downtown Shreveport’s Robinson Film Center on Thursday, June 28 at 6:00 p.m. Click here for more information and tickets. TO-WWN organizes informal breakfast and lunch gatherings for a diverse group of participants who meet to discuss the racial climate in Shreveport and offer suggestions for action and improvement. Breakfast meetings take place on Wednesday mornings at 8:00 a.m. at the Holiday Inn in downtown Shreveport. For more information or to join the email list, please contact Lois Scheib at loisscheib@att.net.